The hotel’s elaborate façade with overhanging balconies and intricate green flowery trim doesn’t foretell the massive property that lies behind the front door. Inside, two buildings combine to form a massive property with more than 200 rooms, a great pool, tasty restaurant, and first-rate spa. Additionally, the incredibly central locale gives guests easy access to public transportation and various neighborhoods that are all reachable by foot. Providing a little bit of everything makes this hotel a standout with a surprisingly reasonable price point. Room types vary as there are two separate buildings fused together. Mostly you’ll get light parquet floors, minimal design, padded leather headboards, smart TVs, and white or brown work desks. All rooms come with Handy devices – a gadget that keeps you online and provides free international calls – in addition to Nespresso machines or kettles for tea and coffee. The best rooms in the house are the rooftop suites that come with their own private pools. Bathrooms are also a mixed bag with shower/tub combinations, shaving mirrors, and Argan bath products. The expansive lobby is decked out with green marble floors, an array of modern and classic Asian art, lots of work and meeting space, and even a kid’s area with toys. A lobby bar has cushy couches and a large flat screen for sports fanatics. The pool is easily the best part of the hotel as the resort like watering hole is surrounded by wood slats, wicker loungers, and receives lots of sunlight for suntanning fiends. The only downside is that it’s only open from April-October – weather pending. Another hotel gem is the spa. Here, guests can receive any number of treatments like facials, massages, scrubs, and more. The adult’s only, co-ed hammam is a nice touch to go along with steam and sauna rooms. The gym is a little small with just a few Life Fitness machines. Open 24/7, there are always apples and water on hand. Restaurant Pelai is the main dining outlet here and serves Mediterranean cuisine for lunch and becomes a more white cloth formal spot for dinner. They also have a wide selection of specialty beers. The lobby bar has loads of cushy couches and serves a bevy of craft cocktails along with salads, sandwiches, and pizzas. Outside by the pool is the Terrace Bar that’s open from 9am-midnight and also cooks up fish and steaks on a barbecue. The hotel is in the very center of the city, which makes walking to any number of things a breeze. Plaça de Catalunya is just down the street and not only are there multiple metro and bus stops, it’s also the entryway to Las Ramblas – the biggest pedestrian street in the city. Nearby the hotel are some universities, so there’s always young energy abounding in the area along with great restaurants and bars. For the healthy minded traveler, check out Flax & Kale (2-minute walk) a flexitarian joint with no ham in sight. If you head down Las Ramblas, you’ll invariably run into La Boqueria (9-minute walk) an enormous outdoor market with more than 200 food stalls. Cocktail fans would do well to check out Two Schmucks (9-minute walk) a laid-back bar with expert mixologists. Just across the street from the hotel is Belushi’s Barcelona (2-minute walk) a solid sports bar with burgers and beers. This hotel has a lot to like. 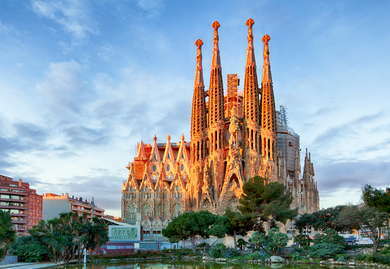 The central location first and foremost gives you easy access to everything Barcelona has to offer. Metro stops are close by and you can walk everywhere to shops, restaurants, museums, and more. Inside this massive property is an excellent spa, perfect pool, and a couple of dining outlets that run the gamut from high-end to casual. Location, price, and amenities makes this hotel a top choice for a young, adventurous traveler looking for like-minded tourists in the city.